Many couples are searching for small wedding venues for their intimate Gatlinburg wedding. Being an affordable wedding venue in the Great Smoky Mountain area, Flower Mountain is first choice for many couples seeking an outside wedding venue. Are you planning a destination wedding or are looking for elopement packages? For couples who are planning their weddings on a budget, we are the perfect location for a private, intimate, elegant and affordable option for couples seeking a ceremony only location. Your wedding ceremony is held at our outdoor pergola area with the majestic Smoky Mountains just a reach away. But unfortunately, weather may not always cooperate with your wedding day. No worries though! Flower Mountain has a "Plan B" in case of rain or inclement weather should arise. Our indoor wedding venue features a beautiful stacked stone hearth as your wedding day back drop. Think warm and inviting Smoky Mountain cabin! Rain or shine... the show must go on! According to a recent article by The Pink Bride, Gatlinburg is crowned, "Wedding Capital of the South", providing wedding services to over 20,000 couples a year. Who can blame them? When mountain view weddings are so beautiful, especially in the autumn and winter seasons, it is hard for couples to resist. Flower Mountain Weddings provides a gorgeous mountain view wedding backdrop, that is perfect for couples seeking a small wedding venue and elopement packages for two. Bride and Groom's dressing suites are also available just for two, and/or your wedding attendants. Our wedding venue provides over 25 acres of privacy to our couples and their special events. Many other Gatlinburg wedding chapels and wedding venues don't provide this comfort to their unsuspecting clients. Have you ever heard the song "Big Yellow Taxi?" If not, check it out. It is what you can expect at most wedding chapels and wedding venues in the Smoky Mountain Area. We offer a true mountain view wedding experience with country elegant, mountain lodge nostalgia, instead of being surrounded by heavy traffic noise of the main roads in Gatlinburg, Pigeon Forge and Sevierville. Don't you deserve exclusivity and privacy for your most important day? If you haven't noticed by now, the sanctity, privacy, photography and your overall wedding experience is a big deal to us. Our outside wedding venue is perfect for small wedding packages and elopement packages. Imagine this mountain view wedding backdrop for your outside wedding ceremony and high quality wedding photography. Flower Mountain, as seen on Google Maps. 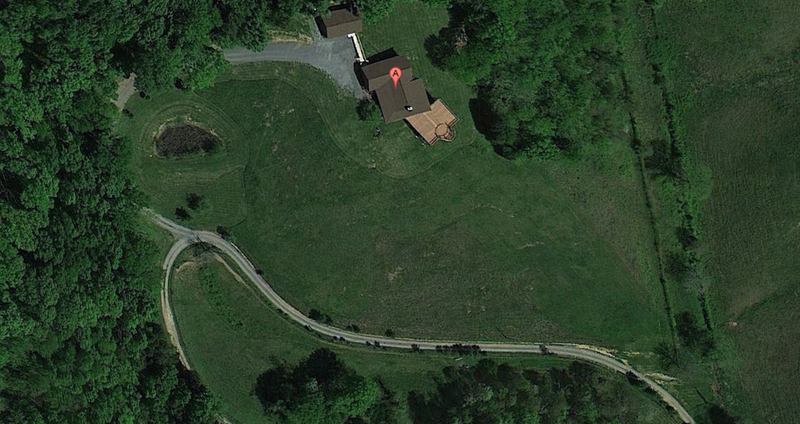 As you can see, our wedding venue is truly surrounded by 25 acres of secluded privacy. How about comparing us with other wedding venues using Google Maps?